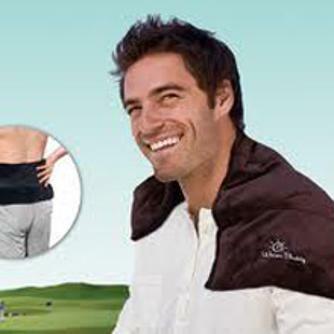 Extra large size, weight and penetrating moist heat provides comfort for those who suffer with back and shoulder pain. Infused with our signature anti-stress aromatherapy blend of lavender, peppermint, eucalyptus, rosemary and cloves. Comes with an adjustable belt to hold the wrap firmly in place. Extra long heat holding – 1 hour or longer. Contains our anti-stress blend. Use warm or cold to assist with the relief of aches, pains and stress.Sports Therapy wrap is the perfect stress relieving gift. (10″ X 26″). The cover comes in black velvet with an embroidered Warm Buddy logo. Recent studies have found that the sports therapy wrap therapy proved to be more effective at treating lower back pain than oral pain medications such as ibuprofen and acetaminophen. Using the sports therapy wrap for sports injuries,muscle aches and pains, the moist penetrating heat will help increase the blood flow to the muscles thus speeding up recovery. The perfect lower back pain relief product. Warm Buddy heat wraps are proudly made in Vancouver BC Canada.Buy it Online now. "I can tell you this almost for sure and that is, as long as you guys continue making these best ever heat packs I will continue to order them. I am a paraplegic with a lot of nerve pain and spasms that can be unbearable but at least with your heat packs I get some relief. On top of that I have two forms of sleep apnea and must go on a servo ventilator at night so I’m going to try your new sleep set!! Thanks! It’s that old personal touch that you add like my dad had in his drug stores. I didn’t think it was possible but your fast personal replies are giving me reason to believe that the internet doesn’t have to be without the “older” fashioned “ personal approach. Keep up the good work! !